Ghosts I–IV (also known as Halo 26) is the seventh studio album from Nine Inch Nails, released March 2, 2008 over the internet and April 8, 2008 in stores worldwide. It is the first NIN material to be independently released since leaving Interscope Records in 2007. The album is a four-volume, 2-disc release consisting of 36 instrumental tracks. Nine Inch Nails presents Ghosts I–IV, a brand new 36 track instrumental collection available right now. Almost two hours of new music composed and recorded over an intense ten week period last fall, Ghosts I - IV sprawls Nine Inch Nails across a variety of new terrain. Trent Reznor explains, "I've been considering and wanting to make this kind of record for years, but by its very nature it wouldn't have made sense until this point. This collection of music is the result of working from a very visual perspective - dressing imagined locations and scenarios with sound and texture; a soundtrack for daydreams. I'm very pleased with the result and the ability :to present it directly to you without interference. I hope you enjoy the first four volumes of Ghosts." Intended as a visual aesthetic to accompany Ghosts I–IV, a 40 page PDF is included with all of the official digital releases from nin.com. Each page is dedicated to a track and serves as the album's credits. The PDF contains photography by Phillip Graybill and Rob Sheridan highlighting the recording process as well as the outside world. The Deluxe and Ultra-Deluxe Limited Edition of Ghosts I–IV will feature a hardcover booklet in a fabric slipcase. When purchasing the album in MP3 or Apple Lossless formats through nin.com, each track is embedded with unique track art that differs from the photograph in the PDF. While some of the images appear to be cropped from the larger PDF, most of the images are noticeably different. Prior to the album's release photos taken in the studio and cryptic messages had been left on the front page of nin.com suggesting "secret things", however there was no mention of an actual album. Ghosts was released without prior warning when a message from Reznor appearing on nin.com announced that 'The new Nine Inch Nails record is available RIGHT NOW!' with a link to ghosts.nin.com where the album is available in various formats. This torrent is an official upload from Nine Inch Nails. We're very proud to present a new collection of instrumental music, Ghosts I-IV. Almost two hours of music recorded over an intense ten week period last fall, Ghosts I-IV sprawls Nine Inch Nails across a variety of new terrain. Ghosts I is the first part of the 36 track collection Ghosts I-IV. Undoubtedly you'll be able to find the complete collection on the same torrent network you found this file, but if you're interested in the release, we encourage you to check it out at ghosts.nin.com, where the complete Ghosts I-IV is available directly from us in a variety of DRM-free digital formats, including FLAC lossless, for only $5. You can also order it on CD, or as a deluxe package with multitrack audio files, high definition audio on Blu-ray disc, and a large hard-bound book. We genuinely appreciate your support, and hope you enjoy the new music. Thanks for listening. Unfortunately, the Ghosts I–IV site is down for the next few hours for maintenance. We quietly released this album last night without any warning, and without any press. Because we know how devoted our fans are, we planned for an overwhelming response, and expected heavy traffic. To our surprise, the traffic was more than three times what we anticipated, and has only been getting heavier throughout the day. The response has been absolutely phenomenal, and we couldn't be happier, but our servers have taken a beating, causing numerous problems with the download site. Our developers, who have been working non-stop to combat the surge of traffic, feel that taking the site down for a few hours to fix some crucial issues is the best way to get things running smoothly again. We sincerely apologize for the inconvenience. 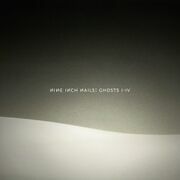 While the site is down, you can still purchase the complete Ghosts I–IV here from Amazon's MP3 store for only $5. The MP3s are high quality and DRM-free. You can also order the deluxe and limited edition packages from Artist in Residence. If you're familiar with BitTorrent, you can download Ghosts I, the first of the four volumes, for free, from our official upload at The Pirate Bay. If you ordered a download and have not yet been able to retrieve it or have experienced any technical difficulties with the download, your download link will work as soon as the site returns. Thanks again for the amazing support, and your continuing patience. Watch nin.com for updates during the downtime. Sorry again about the hassle. Somebody kicked the plug out of our internets, but we're all set now. posted by Trent Reznor at 8:00 PM pst, from hong kong." NIN's PR firm, Nasty Little Man, announced that "barely a day after going on sale, the $300 Ultra-Deluxe Limited Edition of Nine Inch Nails’ Ghosts I-IV has completely sold out" and Ghosts I–IV was at #1 at the Amazon mp3 store. On March 12, it was reported by various sites that nin.com had amassed a first week total of 781,917 transactions (including free and paid downloads as well as orders for physical product), resulting in a take of $1,619,420 USD. Reznor expressed his pleasant surprise over the response in a post on nin.com that read: "We are all amazed at the reaction for what we assumed would be a quiet curiosity in the NIN catalog. My faith in all of you has been restored - let's all go have coffee somewhere (my treat)!" The concept is for you to take whatever tracks you feel inspired by from Ghosts and create what you feel should accompany them visually. You will be able to see all of the submissions, and a team of us (including me) will be sorting through them and setting aside ones we feel are exceptional. Eventually (within a couple of months?) we will present a virtual "film festival" with me and some special guests presenting selections of your work.